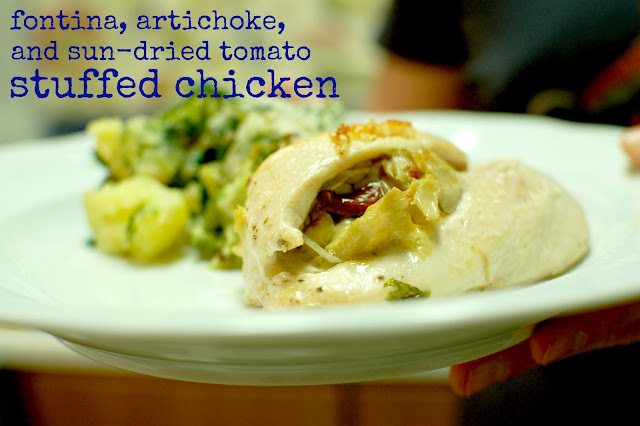 I've made stuffed chicken before but this recipe is by far my favorite. The fontina melts together so well with the artichokes and sun-dried tomatoes to the point that I've now made his dish three times in the past two weeks. The fact that you can buy huge jars of artichokes and sun-dried tomatoes helps have all the ingredients on hand and makes this more affordable than buying a small jar of marinated artichokes which can run close to $10. The recipe calls for making a double amount of filling so that later on in the week you can make a frittata with everything in it. It's a good idea, but so as not to confuse you I'll share with you the recipe if you're using 4 skinless-boneless chicken breasts. Preheat your oven to 375. Next mix in a bowl the artichokes, Fontina, sun-dried tomatoes, and basil. Heat oil in a skillet and add chicken, cooking on one side for 2 minutes. Flip the chicken and then place the skillet in the oven and cook for 10-12 minutes until the chicken is done.